What did ladies wear to bed back in the Victorian era? This Victorian era (1837-1901) dressing gown would've been part of a set of three. It would've had a matching nightgown and chemise to be worn underneath the corset. Sounds a bit uncomfortable for sleepwear, doesn’t it? The lady who originally owned this piece may have only been seen in it by her husband and lady's maid. She may have worn it for warmth in her home or when having to go out to use the facilities. Today, we may think of it akin to a robe or house coat. It is rare to find these still intact as they were often cut up to make dresses with in later decades. We were lucky enough to come across one of these Victorian robes in the shop! 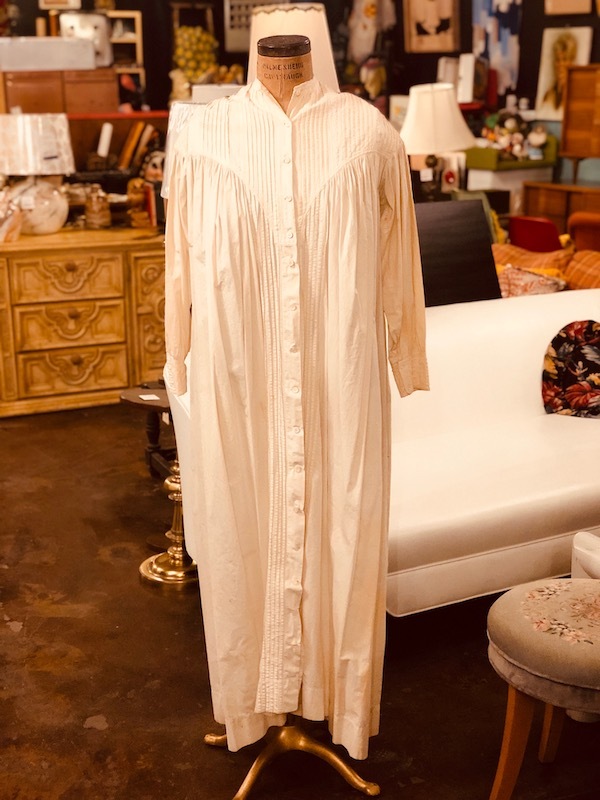 Now, we don’t plan on wearing this to bed, so in true Nest vintage-meets-modern fashion, we would give it a contemporary twist and wear this open as a duster of sorts with some jeans, heeled booties and a colored top. If you’re curious to learn more about Victorian Dressing Gowns and Tea Gowns, this is an informative blog post! Glad you get to go to bed in sweatpants and a comfy tee now?